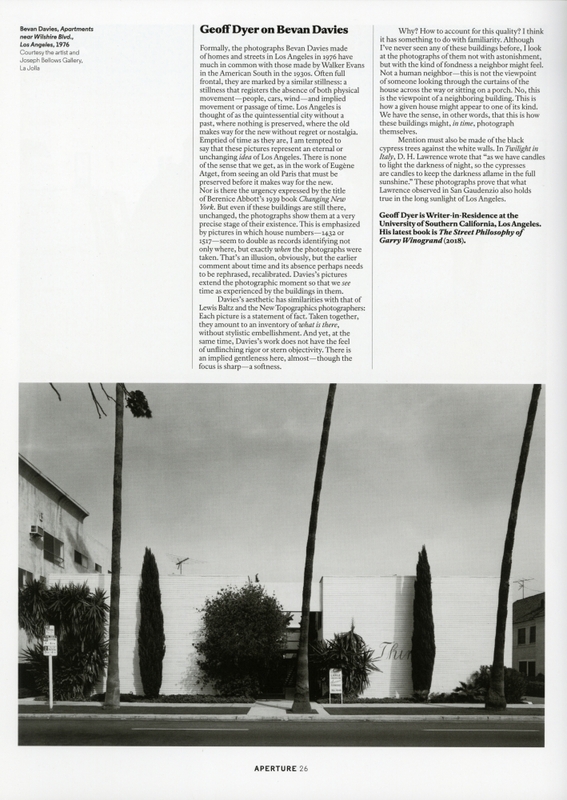 Formally, the photographs Bevan Davies made of homes and streets in Los Angeles in 1976 have much in common with those of Walker Evans in the American South in the 1930s. Often full frontal, they are marked by similar stillness: a stillness that registers the absence of both physical movement - people, cars, wind, - and implied movement or passage of time. Los Angeles is thought of as the quintessential city without a past, where nothing is preserved, where the old makes way for the new without regret or nostalgia. Emptied of time as they are, I am tempted to say these pictures represent an eternal or unchanging idea of Los Angeles. There is none of the sense that we get, as in the work of Eugéne Atget, from seeing an old Paris that must be preserved before it makes its way for the new. Nor is there the urgency expressed by the title of Berenice Abbott’s 1939 book Changing New York. But even if these buildings are still there, unchanged, the photographs show them at a very precise stage of their existence. This is emphasized by the pictures in which house numbers – 1432 or 1517 – seem to double as records identifying not only where, but exactly when the photographs were taken. That’s an illusion, obviously, but the earlier comment about time and its absence perhaps needs to be rephrased, recalibrated. Davies’ pictures extend the photographic moment so that we see time as experienced by the buildings in them. Davies aesthetic has similarities with that of Lewis Baltz and the New Topographics photographers: Each picture is a statement of fact. Taken together, they amount to an inventory of what is there, without stylistic embellishment. And yet, at the same time, Davies work does not have the feel of unflinching rigor or stern objectivity. There is an implied gentleness here, almost–though the focus is sharp–a softness. Why? How to account for this quality? I think it has something to do with familiarity. Although I’ve never seen any of these buildings before, I look at the photographs of them not with astonishment, but with a kind of fondness a neighbor might feel. Not a human neighbor–this is not the viewpoint of someone looking through the curtains of the house across the way or sitting on a porch. No, this is how a given house might appear to one of its kind. We have the sense, in other words, that this is how these buildings might, in time, photograph themselves. Mention must also be made of the black cypress trees against the white walls. In Twilight in Italy, D. H. Lawrence wrote that, “as we have candles to light the darkness of night, so the cypress are candles to keep the darkness aflame in the full sunshine.” These photographs prove that what Lawrence observed in San Gaudenzio also holds true in the long sunlight of Los Angeles. Geoff Dyer is Writer-in-Residence at the University of Southern California, Los Angeles. His latest book is The Street Philosophy of Garry Winogrand (2018).